This tastes like it’s from a restaurant.” Ahhh…music to my food blogging ears. Thank you hubby. He doesn’t lie either. In fact, he’s brutally honest about my recipes. But this one, is undoubtedly a keeper. 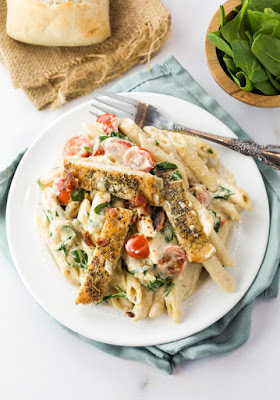 The fresh tomatoes and spinach pair perfectly together, and I never met a creamy garlic Parmesan sauce that I didn’t like, the chicken gives this pasta dish the protein that it needs, and finally, the bacon. Who can really say no to a loaded pasta dish that’s topped with crispy bacon? I really don’t think that anyone could. I personally love to prepare this meal in a cast iron skillet. Searing the chicken in a cast iron skillet helps set the tone for the rest of the meal by giving the pan a ton of delicious flavor that you later use to cook the sauce in. It’s part of what makes this pasta dish so incredibly flavorful. In a large cast-iron skillet, heat 2 tablespoons of olive oil on medium-high heat. While the bacon cooks, prepare the pasta according to package instructions. Once done, drizzle with a little olive oil to prevent sticking, toss, and set aside. 0 Response to "Chicken Bacon Spinach Pasta"